unexpected. It's fun to venture out sometimes! Hope you all are having a lovely day ♥. You look amazing. i love your outfit! The feline print paired with the festive red is super cute! 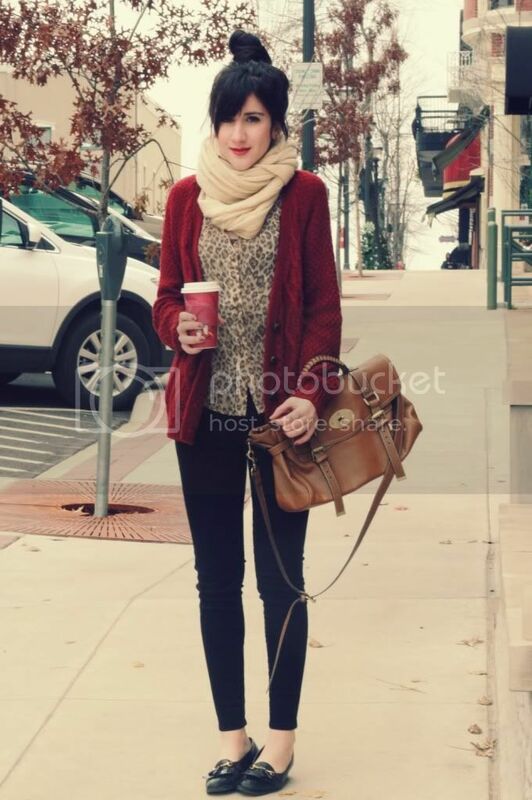 I have the similar cardigan and now you gave me great idea how to style it :) You look very warm and cozy ! I really love the cream with the burgundy. And your hair looks perfect. I need to get me a new chunky knit cardigan since mine is getting a little worse for wear. sweet and cozy, luv it! nice look, love your sweater. love the scarf and this whole entire outfit, really. so cozy and perfect for the season, friend! I want your shoes!!! I really like the color of your cardigan, it looks great against cheetah/leopard print. super cozy!! i love the circle scarf and bag! Super cozy, love the knitted cardigan!! That scarf looks sooo cozy! You're always so perfectly put together - love it! You suit wine red so perfectly! <3 I love the bag too - I thought it was a Mulberry Alexa at first! 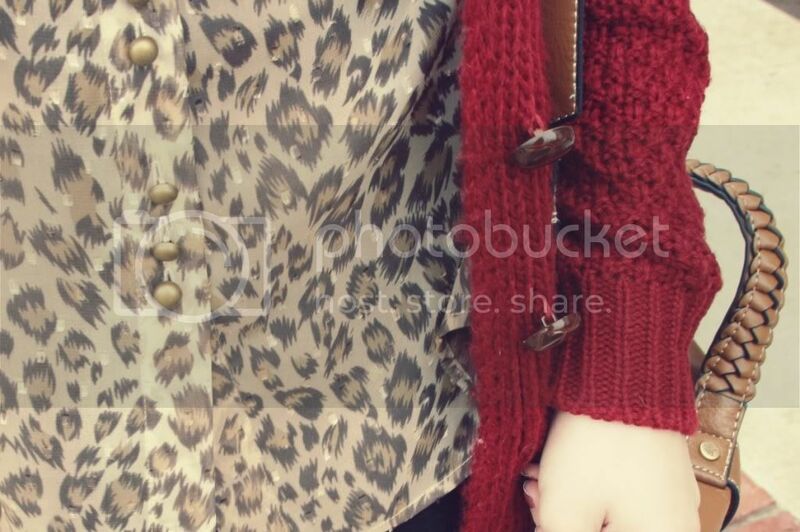 Your leopard print top looks awesome with the cozy, red cardigan. I really love your shoes too. Beautiful wine red cardigan, love it! Brr! I do love the color though. I love this outfit. Your blog is my favorite. I love how you do your bun. It's always so cute and looks wonderful! Looking just as lovely as ever Bonnie! What a great and playful casual look! I know what you mean. Yesterday it was 10. 10! Waaaaaay too damn cold! Gorgeous look - I love your bag and hairdo! 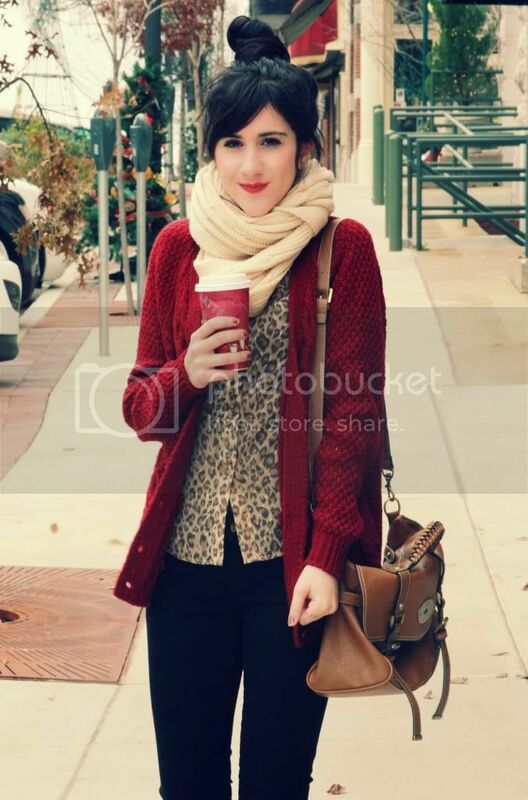 Sipping hot coffee sure makes cold days better, just like cute chunky knits, love your red one! tis the season for red and leopard print - i love it! Love the chunky knit cardigan! And the cheetah print is really cute on you. Your hair never fail to look amazing!! cute, comfy, AND warm. The perfect outfit. Bon bon! This is beautiful! Miss you! you look so cute in red! Love this look!!! :D So chic! Love this outfit, especially the scarf. So cozy! I love this scarf! Im sucha scarf nut! I desperately want that burgundy cardigan. It's so beautiful. And looks so warm. great outfit! I like your sweater! and the colors are here and I fall in nearly summer! dying of heat! MY MOM read ur blog with me, and she said ur damn gorgeous! LITA GIVEAWAY ON MY BLOG!!! Love your sweater, it's so cozy! I love the last photo! You always look perfectly cozy & chique. Hello, fantástic look, your cardigan color is so cute..
You always look extra comfy and cozy in your outfit:) this one is no exception! The cardigan color and your lipstick looks AMAZING together your so adorable! You can't beat a bit of leopard!!! you look so pretty! I want your cardigan. Oooh your loafers are awesome! I love how they are different than your average one! 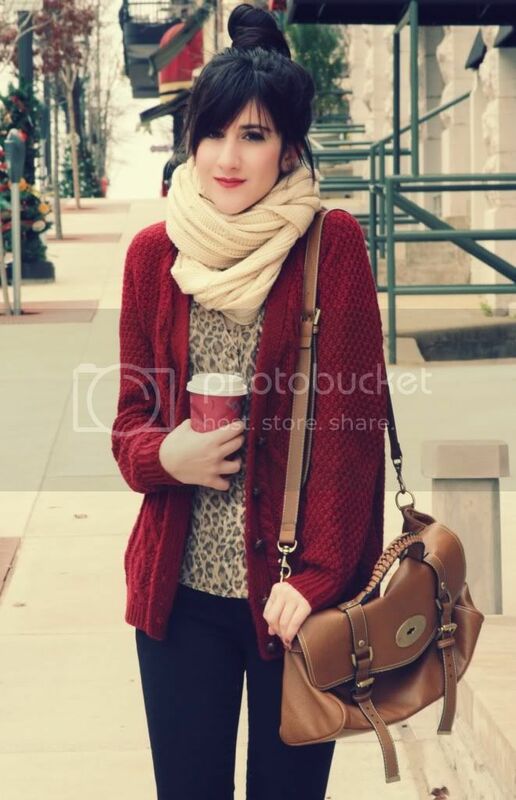 Love the burgandy sweater with the color of your lips, you look so beautiful! Bonnie, you're so pretty like your name.. This is such a cute and cozy outfit! I love the wine red with the leopard and beige. Loving the red lip! You look amazing here, the leopard and burgundy go so well together. You look great! Love the cozy outfit! loving the burgundy sweater (definitely my favorite color this fall/winter), and its perfect paired with leopard print! Loving the color of your cozy sweater, and your scarf is adorable! i'm serious . you're my favorite blogger ever! That red looks great on you! Ohhh how adorable are you? !Love the whole look,the bag is amazing!Red lips are perfect touch! hola, me gusta tu look, la chaqueta queda muy bien combinada con la camisa. love this simple everyday outfit, especially the leo detail :)! we love the outfit, your pic is amazing!! we love the winter, is the best season for buy clothes! nice look the shoes are fabulous! I love that top bun, and the leopard + red cardigan combination! That looks like the perfect fall outfit! Love the leopard blouse!